Got fitted for orthotics last week. 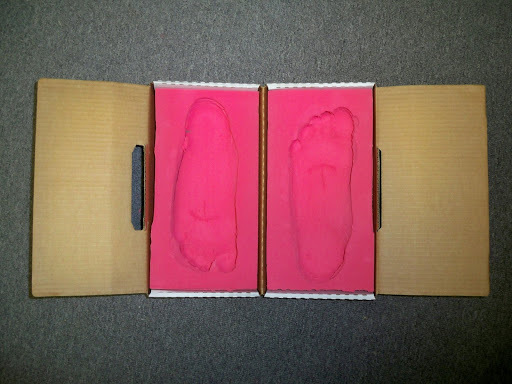 I’ll pick them up next week, but thought you might be interested in what my feet look like in the special molds that they use to craft the orthotics (yeah, sure we are, you bore). I also bought some new shoes. Contrary to conventional wisdom, the pedorthic guy (that’s what they call the person who builds them) says you should buy your new shoes before you get the orthotics fitted for the shoes. So I bought some Saucony ProGrid Stabils. These are a sweet ride. 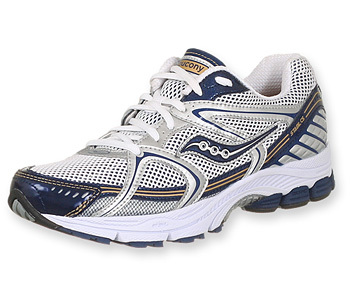 They are lighter than the Mizuno Renegades and the Brooks Beasts. Both of which I can still run in but in low miles. I’ve run in them twice and they feel better each time. I’m in my last week of 3- and 4-mile recovery runs before training for the Nashville Half marathon. It has been hard to get motivated without a plan. I suspected as much–without some goal to work for, I feel lost and aimless. But it does feel good to run again. Now those are some feet!Like you, I feel lost and unmotivated without a race goal in front of me (or a baby). Sounds normal! After 3 straight years running at WDW, I still have a little more downtime than I probably should, but I’ll get over it and so will you. Once you get your orthotics, you’ll be running on clouds! Interesting molds, I was fitted a few years ago for orthotics, and my molds didn’t look near as cool. Plantar Fasheitis(sp?) was my ailment, and when I started running, I was able to stop wearing them after a year or so. Good luck with yours!